New antisemitism is the concept that a new form of antisemitism has developed in the late 20th and early 21st centuries, tending to manifest itself as opposition to Zionism and criticism of the Israeli government. The concept is included in some definitions of antisemitism, such as the Working Definition of Antisemitism and the 3D test of antisemitism. The concept generally posits that in the late 20th and early 21st centuries much of what is purported to be criticism of Israel by various individuals and world bodies is in fact tantamount to demonization, and that together with an alleged international resurgence of attacks on Jews and Jewish symbols, and an increased acceptance of antisemitic beliefs in public discourse, such demonization represents an evolution in the appearance of antisemitic beliefs. Proponents of the concept argue that anti-Zionism and demonization of Israel, or double standards applied to its conduct (some proponents also include anti-Americanism, anti-globalization and Third-Worldism) may be linked to antisemitism, or constitute disguised antisemitism, particularly when emanating simultaneously from the far-left, Islamism, and the far-right. Critics of the concept argue that it conflates political anti-Zionism and criticism of the Israeli government with racism, Jew-hatred and the Holocaust, defines legitimate criticism of Israel too narrowly and demonization too broadly, and trivializes the meaning of antisemitism, and that the concept is used in practice to silence political debate and freedom of speech regarding the ongoing Israeli–Palestinian conflict. French philosopher Pierre-André Taguieff has argued that the first wave of what he describes as "la nouvelle judéophobie" emerged in the Arab-Muslim world and the Soviet sphere following the 1967 Six-Day War, citing papers by Jacques Givet (1968) and historian Léon Poliakov (1969) in which the idea of a new antisemitism rooted in anti-Zionism was discussed. He argues that anti-Jewish themes centered on the demonical figures of Israel and what he calls "fantasy-world Zionism": that Jews plot together, seek to conquer the world, and are imperialistic and bloodthirsty, which gave rise to the reactivation of stories about ritual murder and the poisoning of food and water supplies. [R]ecently we have witnessed the rise of the new left which identifies Israel with the establishment, with acquisition, with smug satisfaction, with, in fact, all the basic enemies [...] Let there be no mistake: the new left is the author and the progenitor of the new anti-Semitism. One of the chief tasks of any dialogue with the Gentile world is to prove that the distinction between anti-Semitism and anti-Zionism is not a distinction at all. Anti-Zionism is merely the new anti-Semitism. The old classic anti-Semitism declared that equal rights belong to all individuals within the society, except the Jews. The new anti-Semitism says that the right to establish and maintain an independent national sovereign state is the prerogative of all nations, so long as they happen not to be Jewish. And when this right is exercised not by the Maldive Islands, not by the state of Gabon, not by Barbados… but by the oldest and most authentic of all nationhoods, then this is said to be exclusivism, particularism, and a flight of the Jewish people from its universal mission. Reviewing Forster and Epstein's work in Commentary, Earl Raab, founding director of the Nathan Perlmutter Institute for Jewish Advocacy at Brandeis University, argued that a "new anti-Semitism" was indeed emerging in America, in the form of opposition to the collective rights of the Jewish people, but he criticized Forster and Epstein for conflating it with anti-Israel bias. Allan Brownfeld writes that Forster and Epstein's new definition of antisemitism trivialized the concept by turning it into "a form of political blackmail" and "a weapon with which to silence any criticism of either Israel or U.S. policy in the Middle East," while Edward S. Shapiro, in A Time for Healing: American Jewry Since World War II, has written that "Forster and Epstein implied that the new anti-Semitism was the inability of Gentiles to love Jews and Israel enough." Actually, the locus classicus, the best formulation of this, was by an ambassador to the United Nations, Abba Eban, [...] He advised the American Jewish community that they had two tasks to perform. One task was to show that criticism of the policy, what he called anti-Zionism — that means actually criticisms of the policy of the state of Israel — were anti-Semitism. That’s the first task. Second task, if the criticism was made by Jews, their task was to show that it’s neurotic self-hatred, needs psychiatric treatment. Then he gave two examples of the latter category. One was I.F. Stone. The other was me. So, we have to be treated for our psychiatric disorders, and non-Jews have to be condemned for anti-Semitism, if they’re critical of the state of Israel. That’s understandable why Israeli propaganda would take this position. I don’t particularly blame Abba Eban for doing what ambassadors are sometimes supposed to do. But we ought to understand that there is no sensible charge. No sensible charge. There’s nothing to respond to. It’s not a form of anti-Semitism. It’s simply criticism of the criminal actions of a state, period. Political antisemitism: denial of the Jewish people's right to self-determination, de-legitimization of Israel as a state, attributions to Israel of all the world's evils. Ideological antisemitism: "Nazifying" Israel by comparing Zionism and racism. Theological antisemitism: convergence of Islamic antisemitism and Christian "replacement" theology, drawing on the classical hatred of Jews. International legal discrimination ("Denial to Israel of equality before the law in the international arena"). Cotler argues that classical antisemitism is discrimination against Jews as individuals whereas the new antisemitism, in contrast, "is anchored in discrimination against the Jews as a people – and the embodiment of that expression in Israel. In each instance, the essence of anti-Semitism is the same – an assault upon whatever is the core of Jewish self-definition at any moment in time." This discrimination is hard to measure, because the indices governments tend to use to detect discrimination – such as standard of living, housing, health and employment – are useful only in measuring discrimination against individuals. Hence, Cotler writes, it is difficult to show that the concept is a valid one. Cotler defines "classical or traditional anti-Semitism" as "the discrimination against, denial of or assault upon the rights of Jews to live as equal members of whatever host society they inhabit" and "new anti-Semitism" as "discrimination against the right of the Jewish people to live as an equal member of the family of nations – the denial of and assault upon the Jewish people's right even to live – with Israel as the "collective Jew among the nations." Cotler elaborated on this position in a June 2011 interview for Israeli television. He re-iterated his view that the world is "witnessing a new and escalating [...] and even lethal anti-Semitism" focused on hatred of Israel, but cautioned that this type of antisemitism should not be defined in a way that precludes "free speech" and "rigorous debate" about Israel's activities. Cotler said that it is "too simplistic to say that anti-Zionism, per se, is anti-Semitic" and argued that labelling Israel as an apartheid state, while in his view "distasteful", is "still within the boundaries of argument" and not inherently antisemitic. He continued: "It's [when] you say, because it's an apartheid state, [that] it has to be dismantled – then [you've] crossed the line into a racist argument, or an anti-Jewish argument." Jack Fischel, former chair of history at Millersville University of Pennsylvania, writes that new antisemitism is a new phenomenon stemming from a coalition of "leftists, vociferously opposed to the policies of Israel, and right-wing antisemites, committed to the destruction of Israel, [who] were joined by millions of Muslims, including Arabs, who immigrated to Europe... and who brought with them their hatred of Israel in particular and of Jews in general." It is this new political alignment, he argues, that makes new antisemitism unique. Mark Strauss of Foreign Policy links new antisemitism to anti-globalism, describing it as "the medieval image of the "Christ-killing" Jew resurrected on the editorial pages of cosmopolitan European newspapers." Rajesh Krishnamachari, researcher with the South Asia Analysis Group, analyzed antisemitism in Iran, Turkey, Palestine, Pakistan, Malaysia, Bangladesh and Saudi Arabia and posited that the recent surge in antisemitism across the Muslim world should be attributed to political expediency of the local elite in these countries rather than to any theological imperative. “ It is the International Red Cross and Red Crescent Movement refusing to put the Star of David on their ambulances. [...] It is neo-Nazis donning checkered Palestinian kaffiyehs and Palestinians lining up to buy copies of Mein Kampf. The French philosopher Pierre-André Taguieff argues that antisemitism based on racism and nationalism has been replaced by a new form based on anti-racism and anti-nationalism. He identifies some of its main features as the identification of Zionism with racism; the use of material related to Holocaust denial (such as doubts about the number of victims and allegations that there is a "Holocaust industry"); a discourse borrowed from third worldism, anti-imperialism, anti-colonialism, anti-Americanism and anti-globalization; and the dissemination of what he calls the "myth" of the "intrinsically good Palestinian – the innocent victim par excellence." In early 2009, 125 parliamentarians from various countries gathered in London for the founding conference of a group called the "Interparliamentary Coalition for Combating Anti-Semitism" (ICCA). They suggest that while classical antisemitism "overlaps" modern antisemitism, it is a different phenomenon and a more dangerous one for Jews. Brian Klug argues that the new prejudice is not antisemitism, new or old; nor a mutation of an existing virus, but "a brand new 'bug'"
“ [W]hen anti-Semitism is everywhere, it is nowhere. And when every anti-Zionist is an anti-Semite, we no longer know how to recognize the real thing—the concept of anti-Semitism loses its significance. He argues that although it is true that the new antisemitism incorporates the idea that antisemitism is hostility to Jews as Jews, the source of the hostility has changed; therefore, to continue using the same expression for it — antisemitism — causes confusion. Today's hostility to Jews as Jews is based on the Arab–Israeli conflict, not on ancient European fantasies. Israel proclaims itself as the state of the Jewish people, and many Jews align themselves with Israel for that very reason. It is out of this alignment that the hostility to Jews as Jews arises, rather than hostility to Israelis or to Zionists. Klug agrees that it is a prejudice, because it is a generalization about individuals; nevertheless, he argues, it is "not rooted in the ideology of 'the Jew'," and is therefore a different phenomenon from antisemitism. The 3D Test of Antisemitism is a set of criteria put forth by Natan Sharansky to distinguish legitimate criticism of Israel from antisemitism. The three Ds stand for Delegitimization of Israel, Demonization of Israel, and subjecting Israel to Double standards, each of which, according to the test, indicates antisemitism. The test is intended to draw the line between legitimate criticism towards the State of Israel, its actions and policies, and non-legitimate criticism that becomes antisemitic. Earl Raab writes that "[t]here is a new surge of antisemitism in the world, and much prejudice against Israel is driven by such antisemitism," but argues that charges of antisemitism based on anti-Israel opinions generally lack credibility. He writes that "a grave educational misdirection is imbedded in formulations suggesting that if we somehow get rid of antisemitism, we will get rid of anti-Israelism. This reduces the problems of prejudice against Israel to cartoon proportions." Raab describes prejudice against Israel as a "serious breach of morality and good sense," and argues that it is often a bridge to antisemitism, but distinguishes it from antisemitism as such. Steven Zipperstein, professor of Jewish Culture and History at Stanford University, argues that a belief in the State of Israel's responsibility for the Arab-Israeli conflict is considered "part of what a reasonably informed, progressive, decent person thinks." He argues that Jews have a tendency to see the State of Israel as a victim because they were very recently themselves "the quintessential victims". Norman Finkelstein writes that anger at what he calls "Israel's brutal occupation has undoubtedly slipped over to an animus against Jews generally", which he describes as "lamentable" but "hardly cause for wonder"
Lewis defines antisemitism as a special case of prejudice, hatred, or persecution directed against people who are in some way different from the rest. According to Lewis, antisemitism is marked by two distinct features: Jews are judged according to a standard different from that applied to others, and they are accused of cosmic evil. He writes that what he calls the first wave of antisemitism arose with the advent of Christianity because of the Jews' rejection of Jesus as Messiah. The second wave, racial antisemitism, emerged in Spain when large numbers of Jews were forcibly converted, and doubts about the sincerity of the converts led to ideas about the importance of "la limpieza de sangre", purity of blood. He associates the third wave with the Arabs and writes that it arose only in part because of the establishment of the State of Israel. Until the 19th century, Muslims had regarded Jews with what Lewis calls "amused, tolerant superiority"—they were seen as physically weak, cowardly and unmilitary—and although Jews living in Muslim countries were not treated as equals, they were shown a certain amount of respect. The Western form of antisemitism—what Lewis calls "the cosmic, satanic version of Jew hatred"—arrived in the Middle East in several stages, beginning with Christian missionaries in the 19th century and continued to grow slowly into the 20th century up to the establishment of the Third Reich. He writes that it increased because of the humiliation of the Israeli military victories of 1948 and 1967. Into this mix entered the United Nations. Lewis argues that the international public response and the United Nations' handling of the 1948 refugee situation convinced the Arab world that discrimination against Jews was acceptable. When the ancient Jewish community in East Jerusalem was evicted and its monuments desecrated or destroyed, they were offered no help. Similarly, when Jewish refugees fled or were driven out of Arab countries, no help was offered, but elaborate arrangements were made for Arabs who fled or were driven out of the area that became Israel. All the Arab governments involved in the conflict announced that they would not admit Israelis of any religion into their territories, and that they would not give visas to Jews, no matter which country they were citizens of. Lewis argues that the failure of the United Nations to protest sent a clear message to the Arab world. Antony Lerman, writing in the Israeli newspaper Ha'aretz in September 2008, argues that the concept of a "new antisemitism" has brought about "a revolutionary change in the discourse about anti-Semitism". He writes that most contemporary discussions concerning antisemitism have become focused on issues concerning Israel and Zionism, and that the equation of anti-Zionism with antisemitism has become for many a "new orthodoxy". He adds that this redefinition has often resulted in "Jews attacking other Jews for their alleged anti-Semitic anti-Zionism". While Lerman accepts that exposing alleged Jewish antisemitism is "legitimate in principle", he adds that the growing literature in this field "exceeds all reason"; the attacks are often vitriolic, and encompass views that are not inherently anti-Zionist. Scholars including Werner Bergmann, Simon Schama, Alan Johnson, David Hirsh and Anthony Julius have described a distinctively 21st century form of antisemitic anti-Zionism characterized by left-wing hostility to Jews. The European Monitoring Centre on Racism and Xenophobia (EUMC) (superseded in 2007 by the Fundamental Rights Agency) noted an upswing in antisemitic incidents in France, Germany, Austria, Sweden, the United Kingdom, Belgium, and The Netherlands between July 2003 and December 2004. In September 2004, the European Commission against Racism and Intolerance, a part of the Council of Europe, called on its member nations to ensure that anti-racist criminal law covers antisemitism, and in 2005, the EUMC offered a discussion paper on a working definition of antisemitism in an attempt to enable a standard definition to be used for data collection: It defined antisemitism as "a certain perception of Jews, which may be expressed as hatred towards Jews. Rhetorical and physical manifestations of antisemitism are directed towards Jews and non-Jewish individuals and/or their property, towards Jewish community institutions and religious facilities." The paper included “Examples of the ways in which anti-Semitism manifests itself with regard to the state of Israel taking into account the overall context could include"
The discussion paper was never adopted by the EU as a working definition, although it was posted on the EUMC website until 2013 when it was removed during a clear-out of non-official documents. Reporting in October 2004, Rufin writes that "[t]he new anti-Semitism appears more heterogeneous," and identifies what he calls a new and "subtle" form of antisemitism in "radical anti-Zionism" as expressed by far-left and anti-globalization groups, in which criticism of Jews and Israel is used as a pretext to "legitimize the armed Palestinian conflict." In June 2011, Chief Rabbi of the United Kingdom, Jonathan Sacks (Lord Sacks), said that the basis for the new antisemitism was the 2001 Durban Conference. Rabbi Sacks also said that the new antisemitism "unites radical Islamists with human-rights NGOs—the right wing and the left wing—against a common enemy, the State of Israel." In September 2006, the All-Party Parliamentary Group against Anti-Semitism of the British Parliament published the Report of the All-Party Parliamentary Inquiry into Antisemitism, the result of an investigation into whether the belief that the "prevailing opinion both within the Jewish community and beyond" that antisemitism had "receded to the point that it existed only on the margins of society." was correct. It concluded that "the evidence we received indicates that there has been a reversal of this progress since the year 2000". In defining antisemitism, the Group wrote that it took into account the view of racism expressed by the MacPherson report, which was published after the murder of Stephen Lawrence, that, for the purpose of investigating and recording complaints of crime by the police, an act must be recorded by the police as racist if it is defined as such by its victim. It formed the view that, broadly, "any remark, insult or act the purpose or effect of which is to violate a Jewish person’s dignity or create an intimidating, hostile, degrading, humiliating or offensive environment for him is antisemitic" and concluded that, given that, "it is the Jewish community itself that is best qualified to determine what does and does not constitute antisemitism." The report stated that, while some witnesses pointed out that the level of antisemitism experienced by Jews in Britain is lower than that faced by Jewish communities in some other parts of Europe and that the Jewish community is not the only minority community in Britain to experience prejudice and discrimination, these arguments provided no comfort to victims of hate and violence, nor should they be used as an excuse to ignore the problem. The report states that some left-wing activists and Muslim extremists are using criticism of Israel as a "pretext" for antisemitism, and that the "most worrying discovery" is that antisemitism appears to be entering the mainstream. It argues that anti-Zionism may become antisemitic when it adopts a view of Zionism as a "global force of unlimited power and malevolence throughout history," a definition that "bears no relation to the understanding that most Jews have of the concept: that is, a movement of Jewish national liberation ..." Having re-defined Zionism, the report states, traditional antisemitic motifs of Jewish "conspiratorial power, manipulation and subversion" are often transferred from Jews onto Zionism. The report notes that this is "at the core of the 'New Antisemitism', on which so much has been written," adding that many of those who gave evidence called anti-Zionism "the lingua franca of antisemitic movements." A number of commentators argue that the United Nations has condoned antisemitism. Lawrence Summers, then-president of Harvard University, wrote that the UN's World Conference on Racism failed to condemn human rights abuses in China, Rwanda, or anywhere in the Arab world, while raising Israel's alleged ethnic cleansing and crimes against humanity. David Matas, senior counsel to B'nai B'rith Canada, has written that the UN is a forum for antisemitism, citing the example of the Palestinian representative to the UN Human Rights Commission who claimed in 1997 that Israeli doctors had injected Palestinian children with the AIDS virus. Congressman Steve Chabot told the U.S. House of Representatives in 2005 that the commission took "several months to correct in its record a statement by the Syrian ambassador that Jews allegedly had killed non-Jewish children to make unleavened bread for Passover. Motives for criticizing Israel in the UN may stem from legitimate concerns over policy or from illegitimate prejudices. [...] However, regardless of the intent, disproportionate criticism of Israel as barbaric and unprincipled, and corresponding discriminatory measures adopted in the UN against Israel, have the effect of causing audiences to associate negative attributes with Jews in general, thus fueling anti-Semitism. In July 2006, the U.S. Commission on Civil Rights issued a Campus Antisemitism report that declared that "Anti-Semitic bigotry is no less morally deplorable when camouflaged as anti-Israelism or anti-Zionism." At the time, the Commission also announced that antisemitism is a "serious problem" on many campuses throughout the United States. In September 2006, Yale University announced that it had established the Yale Initiative for the Interdisciplinary Study of Anti-Semitism, the first university-based institute in North America dedicated to the study of antisemitism. Charles Small, head of the institute, said in a press release that antisemitism has "reemerged internationally in a manner that many leading scholars and policy makers take seriously ... Increasingly, Jewish communities around the world feel under threat. It's almost like going back into the lab. I think we need to understand the current manifestation of this disease." YIISA has presented several seminars and working papers on the topic, for instance "The Academic and Public Debate Over the Meaning of the 'New Antisemitism'". 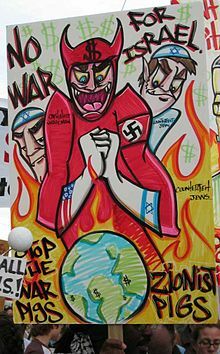 The anti-globalization movement of the late 1990s and early 2000s was accused of displaying elements of New Antisemitism by writers and researchers such as Walter Laqueur, Paul Berman, and Mark Strauss. Critics of this view argue that the allegation is either unfounded or exaggerated, and is intended to discredit legitimate criticism of globalization and free trade economic policies. Mark Strauss of Foreign Policy argues that globalization has stirred anxieties about "outside forces," and that with "familiar anxieties come familiar scapegoats." He writes that what he calls the "backlash against globalization" has united a variety of political elements, from the left to the far-right, via a common cause, and that in so doing, it has "foster[ed] a common enemy." He quotes the French Jewish leader Roger Cukierman who identifies the anti-globalization movement as "an anti-Semitic brown-green-red alliance," which includes ultra-nationalists, the green movement, and communists. Strauss cites Jörg Haider of Austria's far-right Freedom Party and Jean-Marie Le Pen of France's Front national as examples of the far right exploiting their electorate's concerns about globalization. The Movimento Fascismo e Liberta in Italy identifies globalization as an "instrument in the hands of international Zionism," according to Strauss, while in Eastern Europe, ultranationalists and communists have united against foreign investors and multinationals, identifying Jews as a common enemy. American white nationalist Matthew F. Hale of the World Church of the Creator stated of the 1999 protests against the World Trade Organization in Seattle that they were "incredibly successful from the point of view of the rioters as well as our Church. They helped shut down talks of the Jew World Order WTO and helped make a mockery of the Jewish Occupational Government around the world. Bravo." Strauss also cites the neo-Nazi National Alliance, which set up a website called the Anti-Globalism Action Network in order to "broaden [...] the anti-globalism movement to include divergent and marginalized voices." Strauss writes that, as a result of far-right involvement, a "bizarre ideological turf war has broken out," whereby anti-globalization activists are fighting a "two-front battle," one against the World Trade Organization, International Monetary Fund (IMF), and World Bank, the other against the extremists who turn up at their rallies. He points to an anti-globalization march in Porto Alegre, Brazil at which he says some marchers displayed Swastikas and that Jewish peace activists were assaulted. Held two months prior to the U.S.-led attack on Iraq, this year's conference — an annual grassroots riposte to the well-heeled World Economic Forum in Davos — had the theme, "Another World is Possible." But the more appropriate theme might have been "Yesterday's World is Back." Marchers among the 20,000 activists from 120 countries carried signs reading "Nazis, Yankees, and Jews: No More Chosen Peoples!" Some wore T-shirts with the Star of David twisted into Nazi swastikas. Members of a Palestinian organization pilloried Jews as the "true fundamentalists who control United States capitalism." Jewish delegates carrying banners declaring "Two peoples - Two states: Peace in the Middle East" were assaulted. Strauss's arguments have been met with strong criticism from many in the anti-globalization movement. Oded Grajew, one of the founders of the World Social Forum, has written that the WSF "is not anti-Semitic, anti-American, or even anti-socially-responsible capitalism". He claims that some fringe parties have attempted to infiltrate the WSF's demonstrations and promote demonstrations of their own, but adds that "[t]he success of the WSF [...] is a threat to political extremist groups that resort to violence and hatred". Grajew has also written that, to his knowledge, Strauss's claim of Nazi symbols being displayed at an anti-globalization demonstration in Porto Alegre, Brazil is false. Maude Barlow, national chairperson of the Council of Canadians, argues that Strauss has "inflamed, not enlightened" the debate over globalization by making "no distinction between the far right's critique of globalization and that of the global social justice movement", which is premised on "respect for human rights and cultural diversity". She notes that the Council of Canadians has condemned antisemitism, and that it expelled some individuals who tried to organize a David Icke tour under its auspices. John Cavanagh of the International Policy Centre has also criticized Strauss for using unproven allegations of antisemitism to criticize the entire anti-globalization movement, and for failing to research the movement's core beliefs. Although traditional Trotskyite ideology is in no way close to radical Islamic teachings and the shariah, since the radical Islamists also subscribed to anticapitalism, antiglobalism, and anti-Americanism, there seemed to be sufficient common ground for an alliance. Thus, the militants of the far left began to march side by side with the radical Islamists in demonstrations, denouncing American aggression and Israeli crimes. ... And it was only natural that in protest demonstrations militants from the far right would join in, antisemitic banners would be displayed, anti-Jewish literature such as the Protocols would be sold. Similar allegations have been made by Sol Stern, a senior fellow of the Manhattan Institute and a contributing editor to City Journal. Stern identifies what he sees as antisemitism within the movement as a function of Jews no longer being portrayed as the victims of capitalism, but rather as its masters. A March 2003 report on antisemitism in the European Union by Werner Bergmann and Juliane Wetzel of the Berlin Research Centre on Anti-Semitism identifies anti-globalization rallies as one of the sources of antisemitism on the left. The [anti-]globalization movement isn't anti-Semitic, it just hasn't fully confronted the implications of diving into the Middle East conflict. Most people on the left are simply choosing sides. In the Middle East, where one side is under occupation and the other has the U.S. military behind it, the choice seems clear. But it is possible to criticize Israel while forcefully condemning the rise of anti-Semitism. And it is equally possible to be pro-Palestinian independence without adopting a simplistic pro-Palestinian/anti-Israel dichotomy, a mirror image of the good versus evil equations so beloved by President George W. Bush. ^ Cohen, Florette (September 2011). The New Anti-Semitism Israel Model: Empirical Tests. BiblioBazaar. ISBN 9781243561398. ^ Zuckerman, Mortimer B. "Graffiti on History's Walls", Jewish World Review. March 11, 2003, retrieved January 12, 2008; also see Harrison, Bernard. The Resurgence of Anti-Semitism: Jews, Israel, and Liberal Opinion. Rowman & Littlefield, 2006. ^ Pierre-André Taguieff cites the following early works on the new antisemitism: Jacques Givet, La Gauche contre Israel? Essai sur le néo-antisémitisme, Paris 1968; idem, "Contre une certain gauche," Les Nouveaux Cahiers, No. 13-14, Spring-Summer 1968, pp. 116–119; Léon Poliakov, De l'antisionisme a l'antisémitisme, Paris 1969; Shmuel Ettinger, "Le caractère de l'antisémitisme contemporain," Dispersion et Unité, No. 14, 1975, pp. 141–157; and Michael Curtis, ed., Antisemitism in the Modern World, Boulder, 1986. All cited in Pierre-André Taguieff. Rising from the Muck: The New Anti-Semitism in Europe. Ivan R. Dee, 2004, p. 159-160, footnote 1. ^ Raab, Earl. "Is there a New Anti-Semitism? ", Commentary, May 1974, pp. 53–54. ^ Edward S. Shapiro. A Time for Healing: American Jewry Since World War II. Johns Hopkins University Press. 1992. ISBN 0-8018-4347-2. Page 47. ^ Wistrich, Robert. "Anti-zionism as an Expression of Anti-Semitism in Recent Years" Archived 2017-05-12 at the Wayback Machine, lecture delivered to the Study Circle on World Jewry in the home of the President of Israel, December 10, 1984. ^ Chomsky, Noam. "TRANSCRIPT of Amy Goodman interview of Noam Chomsky". Retrieved 19 May 2016. ^ Irwin Cotler cited Dershowitz, Alan. The Case For Israel. John Wiley and Sons, 2003, p. 210-211. ^ a b Irwin Cotler, Making the world 'Judenstaatrein'[permanent dead link], The Jerusalem Post, February 22, 2009. ^ David Sheen, "Canadian MP Cotler: Calling Israel an apartheid state can be legitimate free speech", Haaretz, 1 July 2011. Accessed 7 July 2011. ^ Fischel, Jack R. "The New Anti-Semitism", The Virginia Quarterly Review, Summer 2005, pp. 225–234. ^ Tembarai Krishnamachari, Rajesh. "Localized motivations for antisemitism within the Ummah" in South Asia Analysis Group, Paper 5907, April 2015. ^ a b c Klug, Brian. "In search of clarity" Archived 2007-09-27 at the Wayback Machine, Catalyst, March 17, 2006. ^ Klug, Brian. Israel, Antisemitism and the left Archived 2006-10-23 at the Wayback Machine, Red Pepper, November 24, 2005. ^ Goodman, Amy. "Finkelstein on DN! No New Antisemitism" Archived 2006-11-15 at the Wayback Machine, interview with Norman Finkelstein, August 29, 2006. ^ "So What's New? Rethinking the 'New Antisemitism' in a Global Age" (PDF). ^ "Remarks at the 2011 B'nai B'rith International Policy Conference". 2012-12-02. Archived from the original on 2012-12-02. Retrieved 2018-06-11. ^ Finkelstein, Norman. Beyond Chutzpah: On the Misuse of Anti-Semitism and the Abuse of History, University of California Press, 2005, p. 66–71. ^ Finkelstein, Norman. Beyond Chutzpah: On the Misuse of Anti-Semitism and the Abuse of History, University of California Press, 2005, pp. 78–79. ^ Ali, Tariq. "Notes on Anti-Semitism, Zionism and Palestine" Archived 2010-12-07 at the Wayback Machine, Counterpunch, March 4, 2004, first published in il manifesto, February 26, 2004. ^ a b c d e Lewis, Bernard. "The New Anti-Semitism" Archived 2011-09-08 at the Wayback Machine, The American Scholar, Volume 75 No. 1, Winter 2006, pp. 25–36 The paper is based on a lecture delivered at Brandeis University on March 24, 2004. ^ a b Tzvi Fleischer (May 2007). "Hate's Revival". Australia/Israel Review. AIJAC. ^ Fulford, Robert (2009-08-15). "When criticizing Israel becomes ritual". nationalpost.com. Archived from the original on 2012-09-12. Retrieved 2009-08-15. ^ a b c Pelinka, Anton; et al. (2009). Handbook of Prejudice. Chapter on Anti-Semitism by Werner Bergmann. Cambria Press. p. 56. ISBN 1604976276. Cite error: Invalid <ref> tag; name "Bergmann" defined multiple times with different content (see the help page). ^ Schama, Simon (19 February 2016). "The left's problem with Jews has a long and miserable history". Financial Times. Retrieved 26 February 2016. ^ Hirsh, David (30 November 2006). "Openly Embraing Prejudice". The Guardian. Retrieved 6 March 2016. ^ Julius, Anthony (2010). Trials of the Diaspora: A History of Anti-Semitism in England. Oxford University Press. p. 476. ISBN 0199297053. ^ Johnson, Alan (Fall 2015). "The Left and the Jews: Time for a Rethink". Fathom. Retrieved 26 February 2016. ^ a b "(U.S.) State Department report on Anti-Semitism: Europe and Eurasia" excerpted from a longer piece, and covering the period of July 1, 2003 – December 15, 2004. ^ a b tp://eumc.eu.int/eumc/material/pub/AS/AS-WorkingDefinition-draft.pdf "Working definition of antisemitism" Archived 2011-01-25 at the Wayback Machine, EUMC. ^ "Working Definition of Antisemitism" (PDF). European Union Agency for Fundamental Rights. Archived from the original (PDF) on 5 January 2010. Retrieved 23 July 2017. ^ "Report of the All-Party Parliamentary Inquiry into Anti-Semitism" Archived 2013-08-22 at the Wayback Machine, September 2006, p. 1. ^ "Report of the All-Party Parliamentary Inquiry into Anti-Semitism" Archived 2013-08-22 at the Wayback Machine, September 2006, p. 22. ^ Announcement by the Forum[permanent dead link], November 18, 2001. ^ Summers, Lawrence H. Address at morning prayers Archived 2004-10-10 at the Wayback Machine, September 17, 2002. On the site of Harvard University, accessed January 9, 2006. ^ Matas, David. Anti-Zionism and Anti-Semitism. Dundurn Press, Toronto, 2005, pp. 129–144. ^ Rickman, Gregg J. (2008). "Contemporary global anti-semitism" (PDF). USDOS. Retrieved 2008-03-27. ^ "Yale Creates Center to Study Antisemitism", Associated Press, September 19, 2006; also see Kaplan, Edward H. & Small, Charles A. "Anti-Israel sentiment predicts anti-Semitism in Europe," Journal of Conflict Resolution, Vol 50, No. 4, 548–561, August 2006. ^ a b c "Global Anti-Semitism Report" Archived 2009-01-15 at the Wayback Machine, U.S. Department of State, January 5, 2005. ^ a b "France" Archived 2012-11-19 at the Wayback Machine, The Stephen Roth Institute for the Study of Antisemitism and Racism, Tel Aviv University, 2003. ^ Joffe, Josef. "Nations we love to hate: Israel, America and the New Anti-Semitism" Archived 2006-09-09 at the Wayback Machine, Posen Papers in Contemporary Antisemitism, No.1, Vidal Sassoon Center for the Study of Antisemitism, Hebrew University of Jerusalem, 2004, p.9. ^ Joffe, Josef. "Nations we love to hate: Israel, America and the New Anti-Semitism" Archived 2006-09-09 at the Wayback Machine, Posen Papers in Contemporary Antisemitism, No.1, Vidal Sassoon Center for the Study of Antisemitism, Hebrew University of Jerusalem, 2004, p.12. ^ Raynes-Goldie, Kate. "Race Baiting: Adbusters' listing of Jewish neo-cons the latest wacko twist in left mag's remake" Archived 2007-10-18 at the Wayback Machine, Nowtoronto.com, March 18, 2004 – March 24, 2004. ^ a b c d e Monnot, Caroline & Ternisien, Xavier. Caroline Monnot and Xavier Ternisien. "Tariq Ramadan accusé d'antisémitisme" Archived 2008-10-05 at the Wayback Machine, Le Monde, October 10, 2003. Bauer, Yehuda. "Problems of Contemporary Anti-Semitism" at the Wayback Machine (archived July 5, 2003), lecture to the Jewish Studies Dept of the University of California, Santa Cruz, 2003, retrieved April 22, 2006. Chanes, Jerome. "Review Essay: What's "New" – and what's not – about the New Antisemitism? ", Jewish Political Studies Review 16:1–2 (Spring 2004). Conger, George. "UK MPs find leap in anti-Semitism"[permanent dead link], The Jerusalem Post, September 5, 2006. Finkelstein, Norman. Beyond Chutzpah: On the Misuse of Anti-Semitism and the Abuse of History. Berkeley and Los Angeles: University of California Press, 2005. Foxman, Abraham H. Never Again? The Threat of the New Anti-Semitism. New York: HarperSanFrancisco (an imprint of Harper Collins), 2003. ISBN 0-06-054246-2 (10); ISBN 978-0-06-054246-7 (13). Kaplan, Edward H. & Small, Charles A. "Anti-Israel sentiment predicts anti-Semitism in Europe," Journal of Conflict Resolution, Vol 50, No. 4, 548–561, August 2006. "American White Supremacist David Duke: Israel Makes the Nazi State Look Very Moderate", interview with David Duke on Syrian television, the Middle East Media Research Institute (MEMRI), November 25, 2005. Clip of the interview and of Duke's speech to a Syrian rally can be viewed here . "Antisemitism: Summary overview of the situation in the European Union, 2001–2005 (working paper)", European Monitoring Centre on Racism and Xenophobia, May 2006. Arnold Forster & Benjamin Epstein, The New Anti-Semitism. McGraw-Hill 1974, p. 165. See for instance chapters entitled "Gerald Smith's Road" (19–48), "The Radical Right" (285–296), "Arabs and Pro-Arabs" (155–174), "The Radical Left" (125–154). Taguieff, Pierre-André. Rising From the Muck: The New Anti-Semitism in Europe. Ivan R. Dee, 2004. Bergmann, Werner & Wetzel, Julie. ""Manifestations of Anti-Semitism in the European Union"" (PDF). Archived from the original (PDF) on 2005-04-15. (751 KB), Berlin Research Centre on Anti-Semitism, Berlin Technical University. Chomsky, Noam. Necessary Illusions at the Library of Congress Web Archives (archived September 13, 2002), accessed January 9, 2006. Cohen, Ben. "The Persistence of Anti-Semitism on the British Left" Jewish Political Studies Review 16:3–4 via the Jerusalem Center for Public Affairs, Fall 2004. Dinnerstein, Leonard. "Is There a New Anti-Semitism in the United States?" Society, 41 (January/February 2004), 53–58. Gerstenfeld, Manfred. "Anti-Israelism and Anti-Semitism: Common Characteristics and Motifs"Jewish Political Studies Review 19:1–2 Jerusalem Center for Public Affairs, March 1, 2007. Gerstenfeld, Manfred. "The Academic Boycott Against Israel", Jewish Political Studies Review 15:3–4 (Fall 2003). Greenspan, Miriam. (Nov–Dec 2003). "The New Anti-Semitism". Tikkun 18:6. p. 33. Kite, Melissa. "Labour should have fought back on immigration, says Euan Blair's girlfriend"[permanent dead link], The Telegraph, April 17, 2005. Klug, Brian. "The collective Jew: Israel and the new antisemitism," used as a resource by the EUMC in their report Manifestations of Antisemitism in the EU 2002–2003, Vienna, March 2004. See especially pp. 12–13, 225–241. Weill-Raynal, Guillaume [fr], Une haine imaginaire : contre-enquête sur le nouvel antisémitisme (An imaginary hatred: investigation about the new antisemitism), Paris, Armand Colin, 2005, ISBN 2-200-26912-9. This page was last edited on 4 April 2019, at 18:00 (UTC).